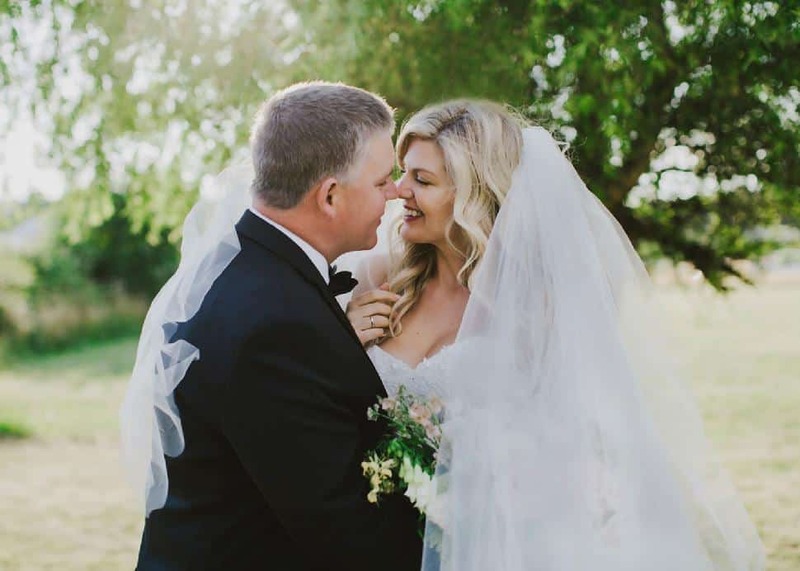 From around nine years old, the pair looked out for each other. 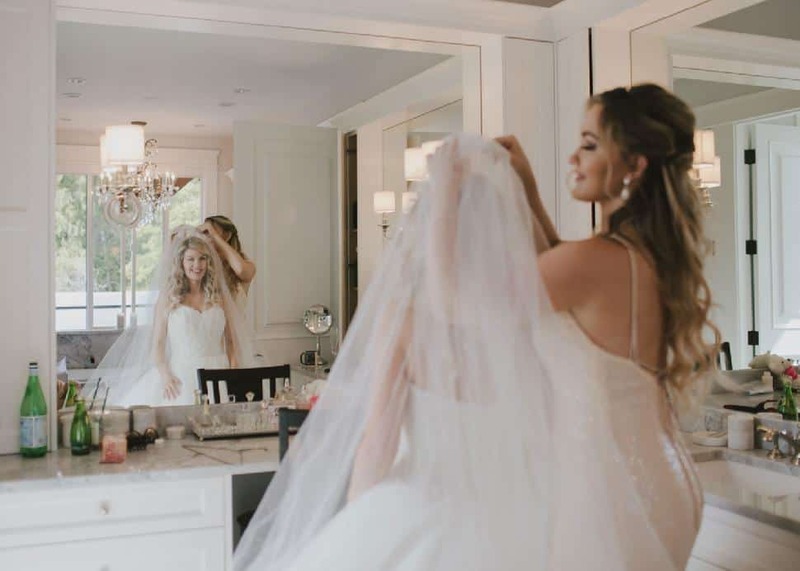 Carly used to sneak Morgan into her room and let him sleep in her closet. 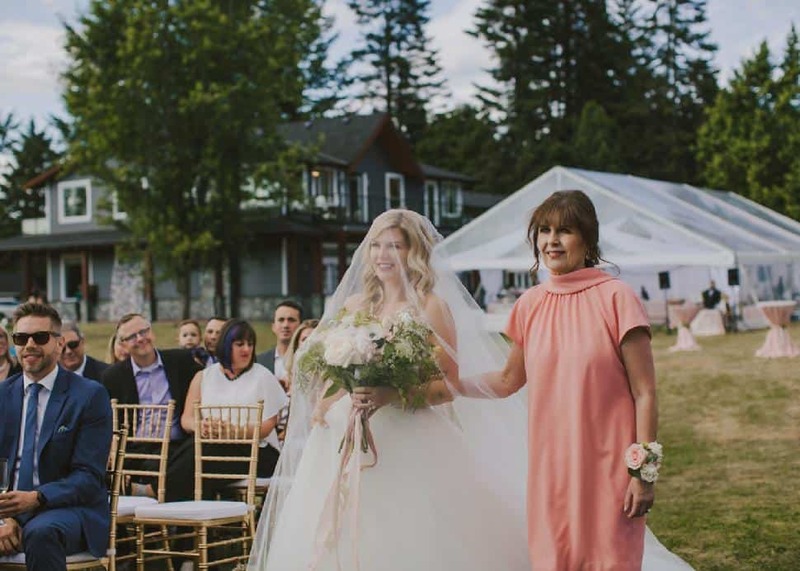 They remained friends through their teens, but when Carly moved to Vancouver to explore the big city, Morgan remained on the Island. 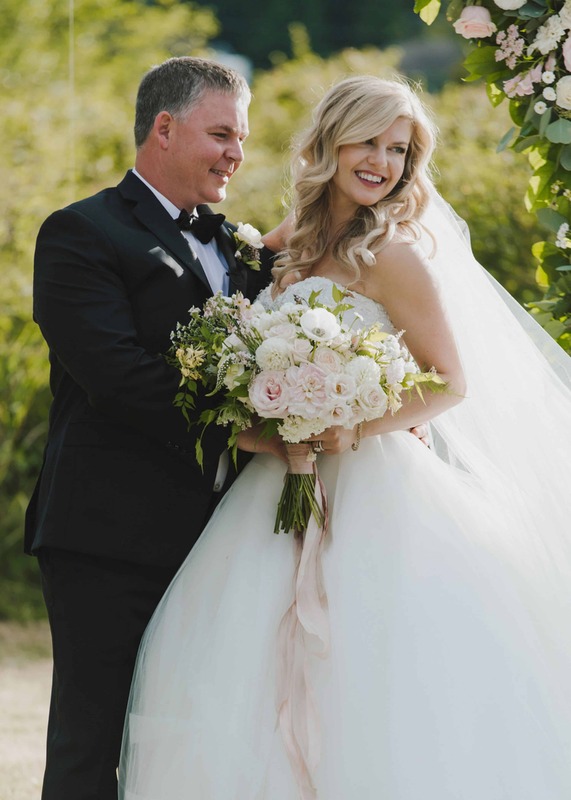 Fast forward to the summer of 2015 when Morgan called up his childhood friend before flying out to Vancouver on business, only to discover that Carly was single and living on Vancouver Island. 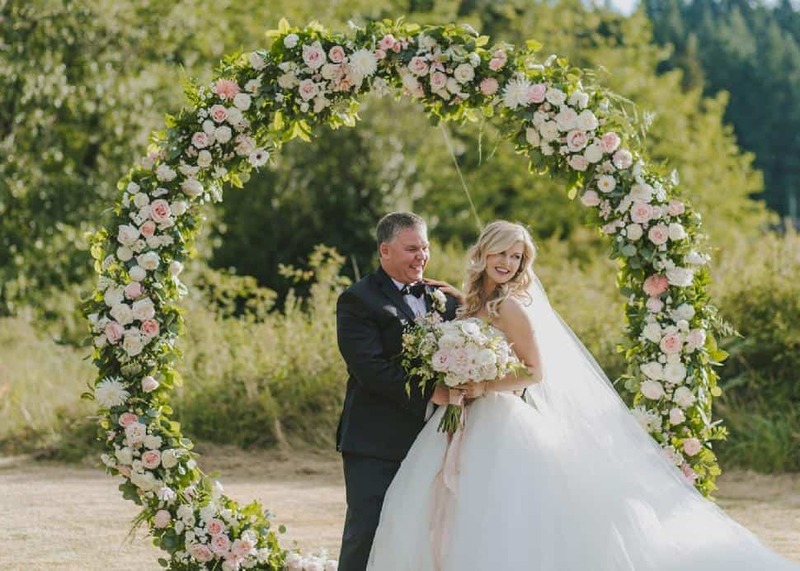 She invited him to a wedding and they’ve been together ever since. 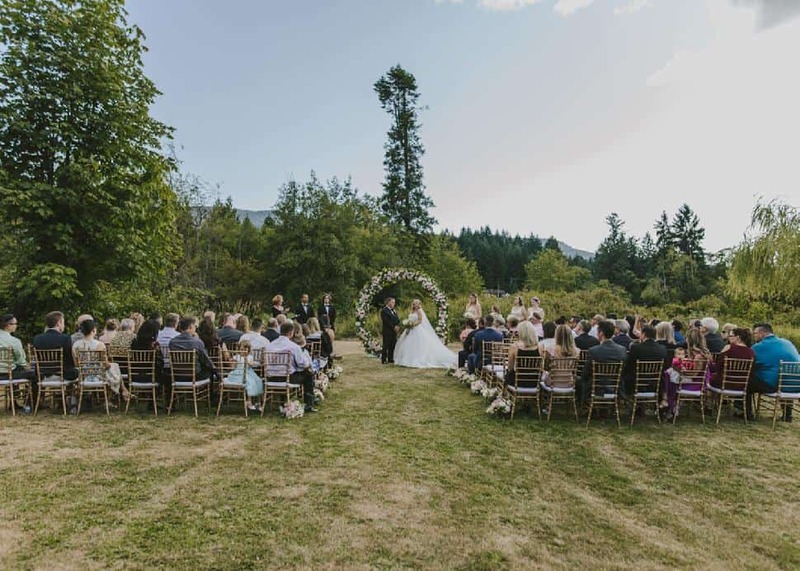 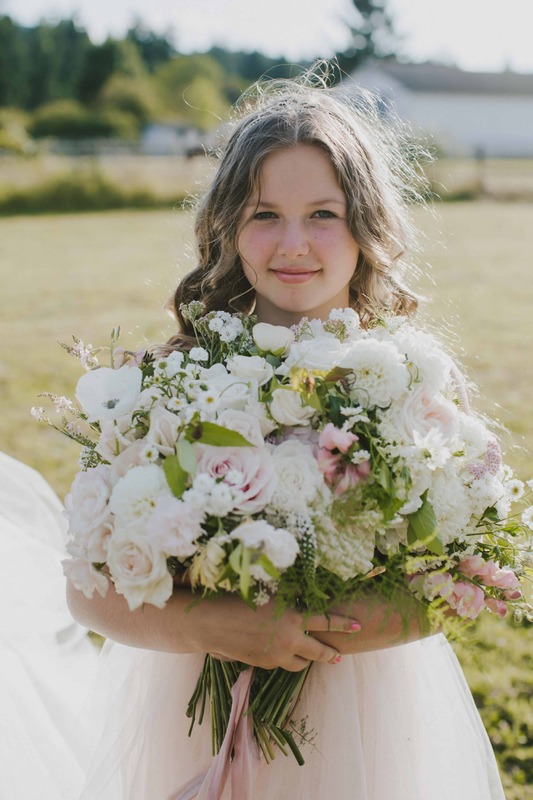 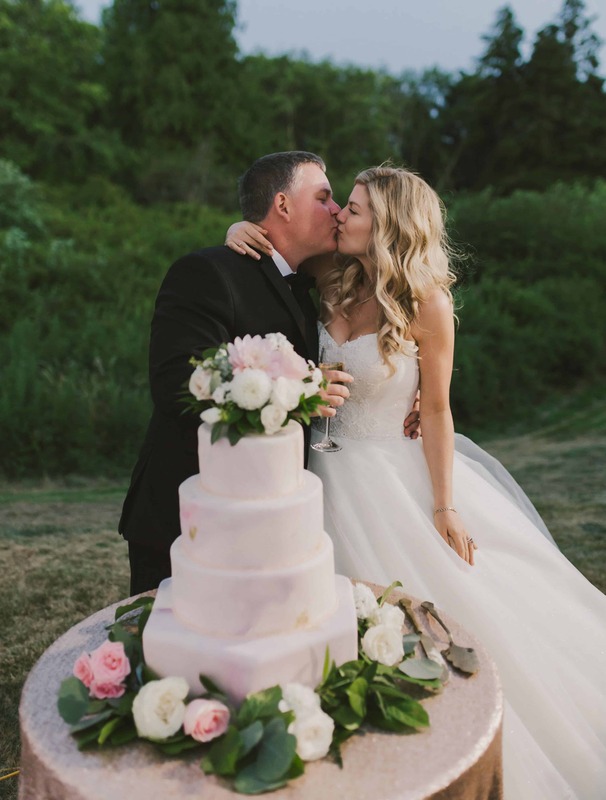 Close bonds tie the couple together, and for their ceremony they wanted an intimate gathering of around 80 family and friends on their private Vancouver Island acreage. 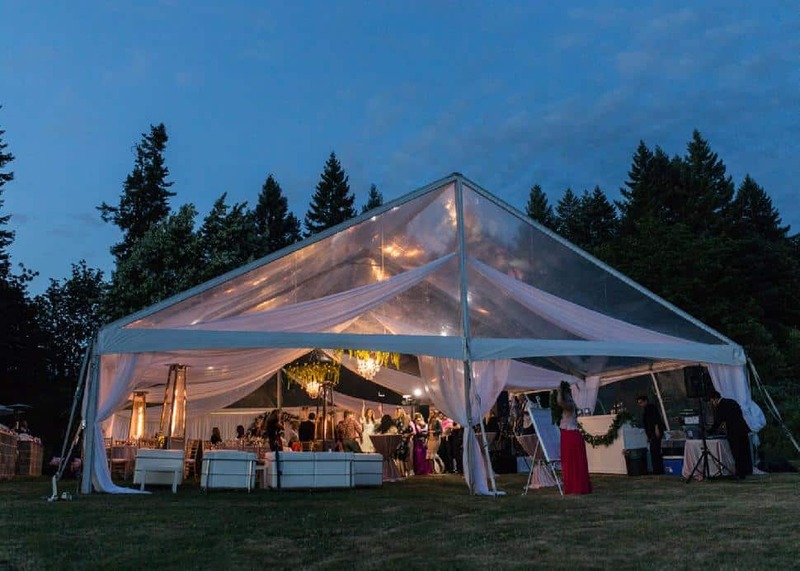 The estate was the perfect setting for a wedding that was anything but casual. 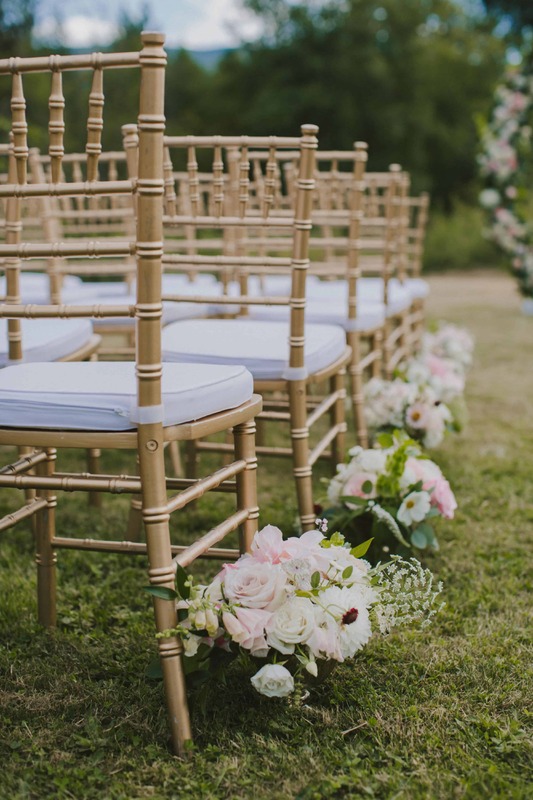 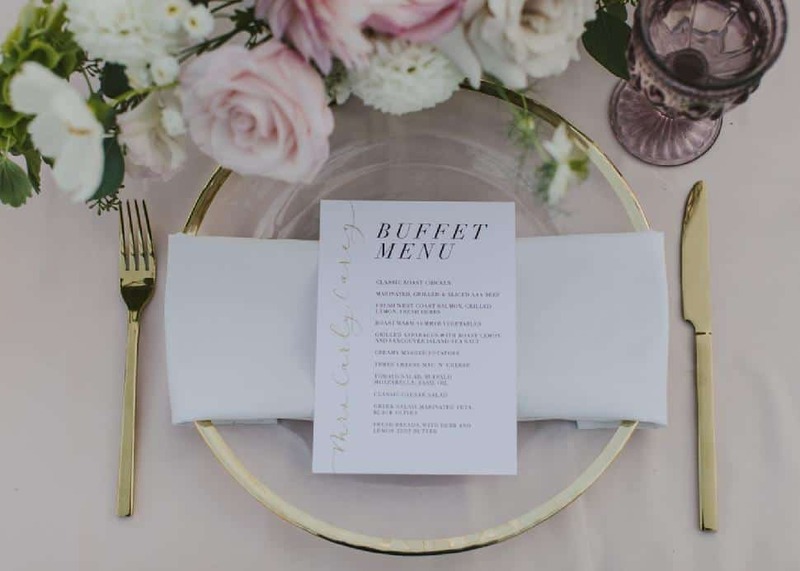 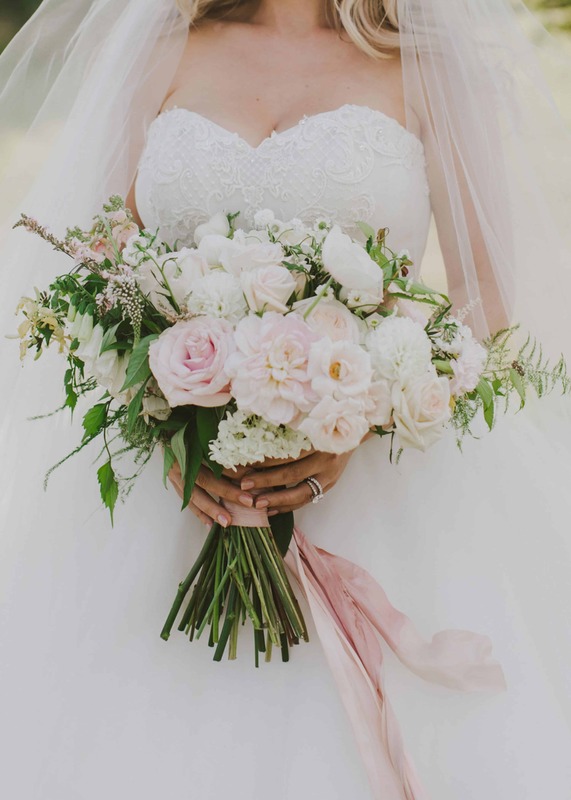 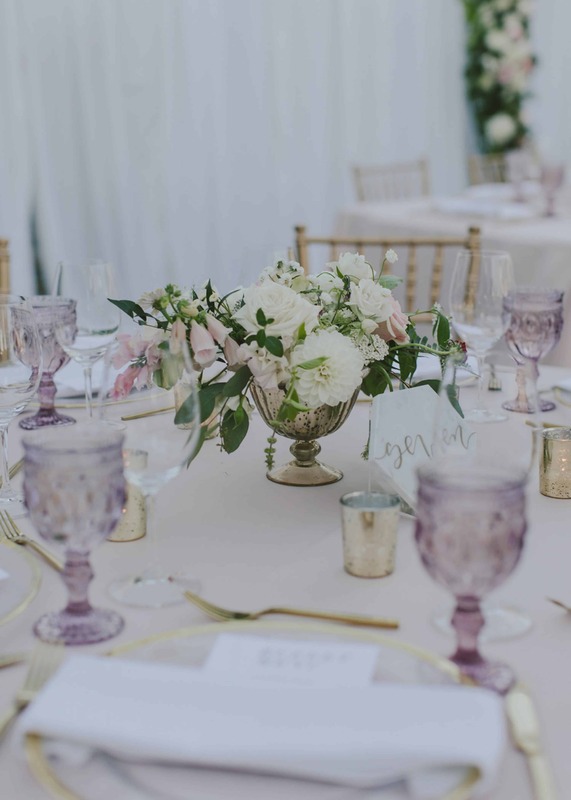 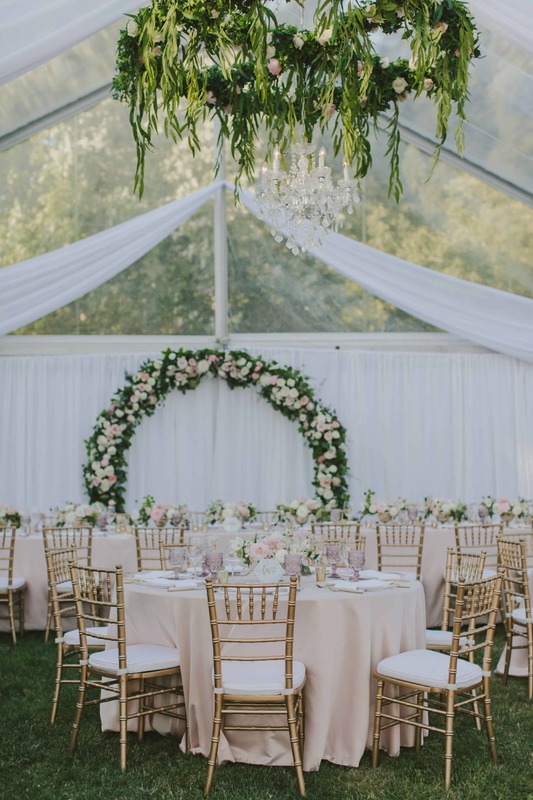 “I didn’t want it to be a casual backyard thing,” explains Carly, “so our wedding planner Olivia Cross brought our backyard to life.” A love of pink inspired a romantic scene of blush satin linens on tables with gold chargers, servingware and pink goblets framed by ornate gold Chiavari chairs. 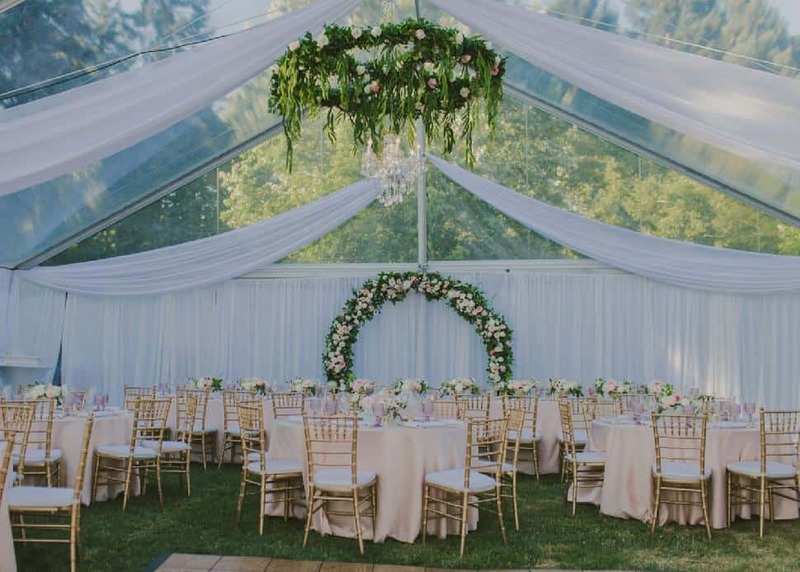 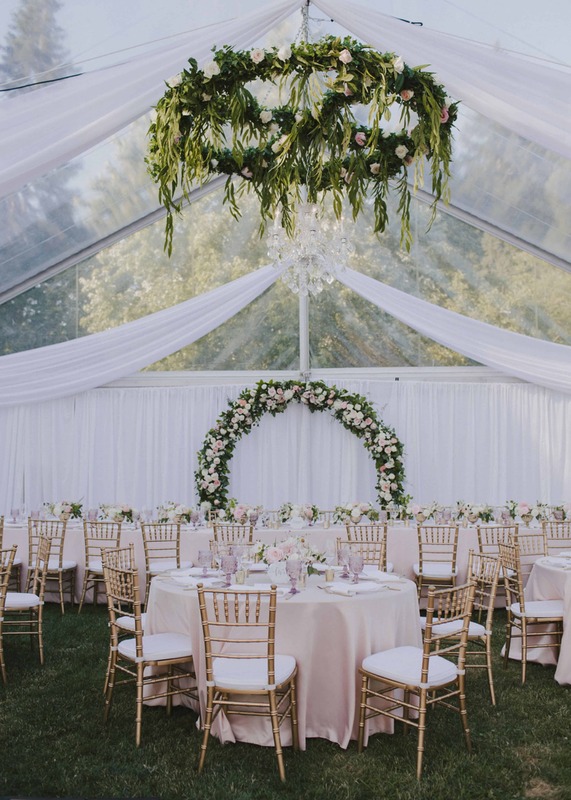 A clear tent was draped with sheer white fabric in the fairy-tale space, with a botanical chandelier hanging from above. 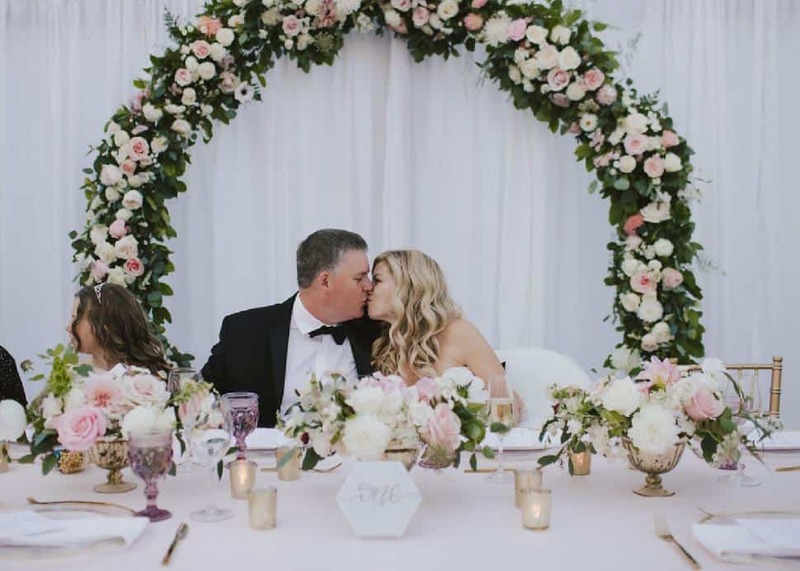 The flower arch the couple married under—handmade and assembled on the day with fresh flowers—moved to crown the head table during dinner. 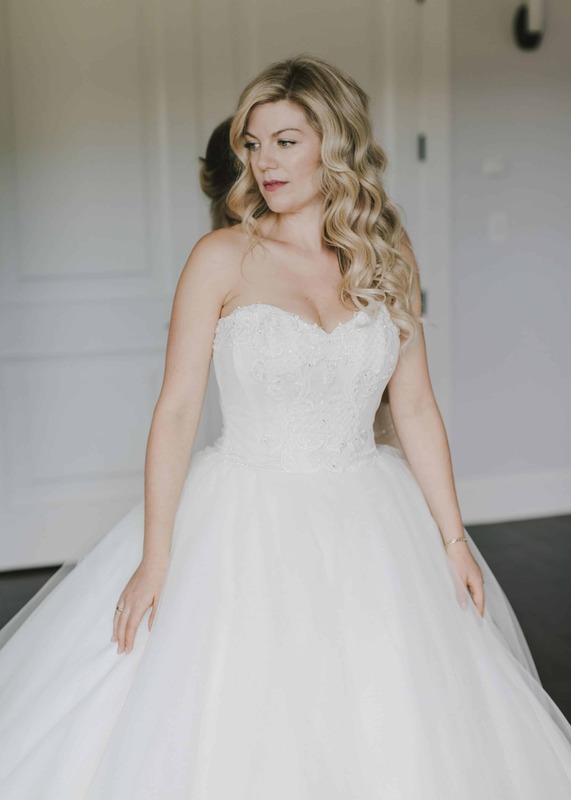 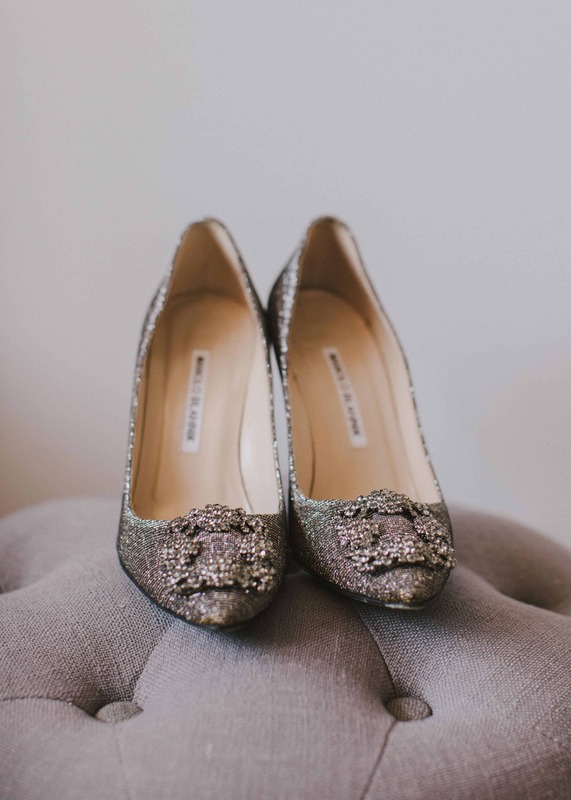 The bride chose an Ines di Santo gown from Bisou Bridal with just the right amount of sparkle for the upscale affair. 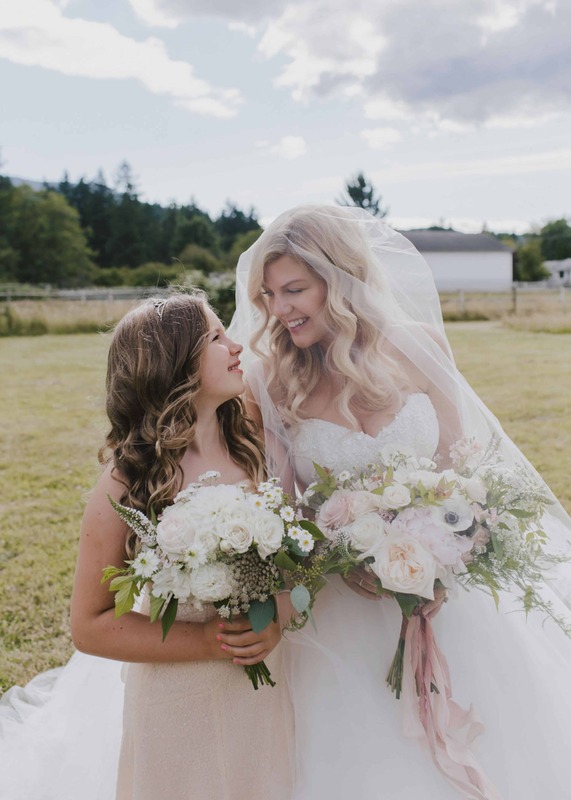 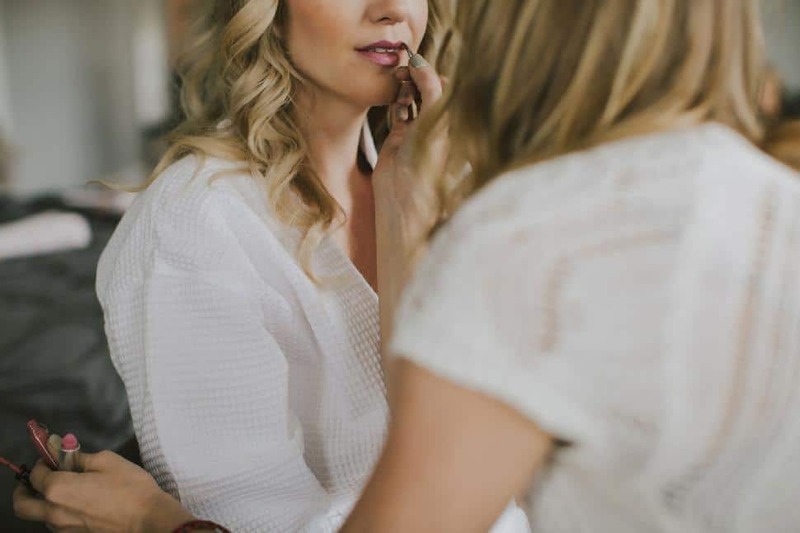 Hair stylist Christine LeBlanc continued the vision with Carly’s old Hollywood-inspired waves, while Artistry by Alexa in Victoria gave Carly a polished makeup look. 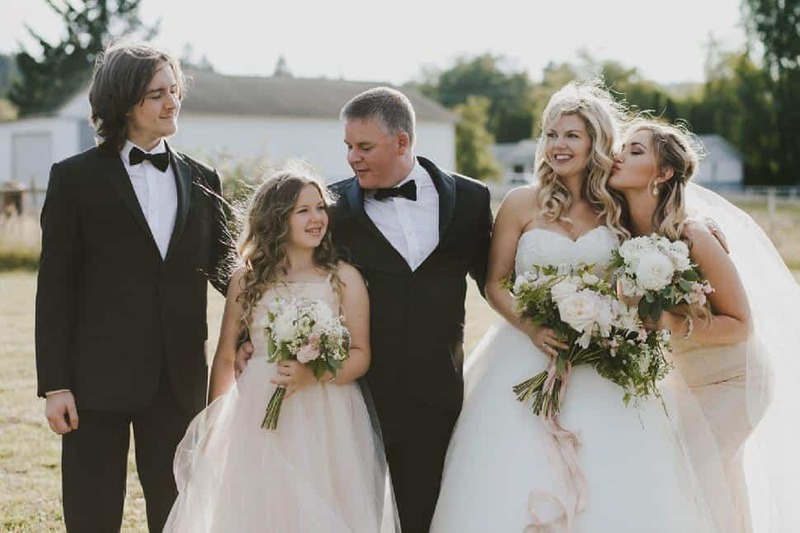 Morgan and the groomsmen complemented blush bridesmaids in classic black tuxedos from Tip Top Tailors. 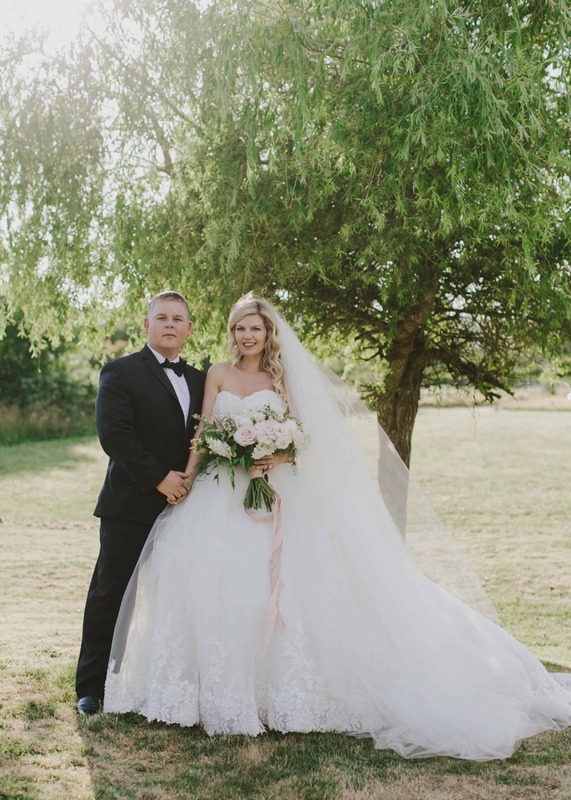 Wedding planner Olivia Cross of Lavish Engagements helped the couple make sure the wedding was glamorous and special. 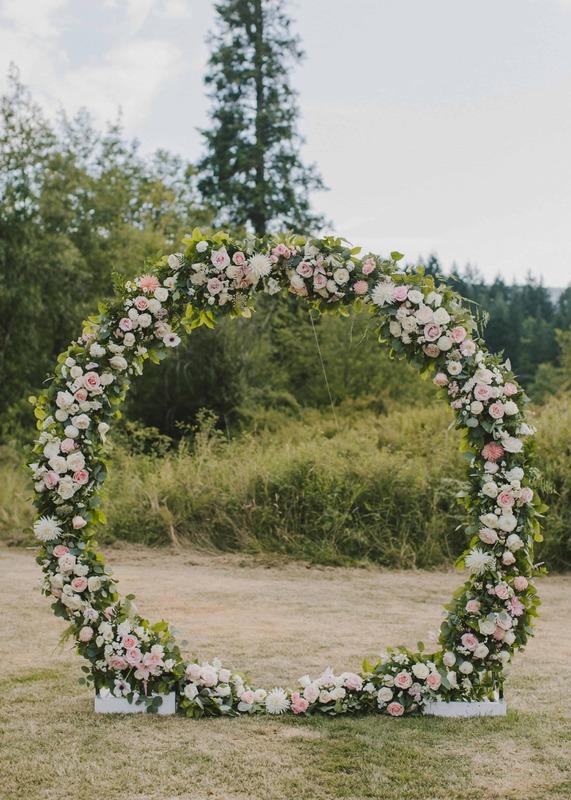 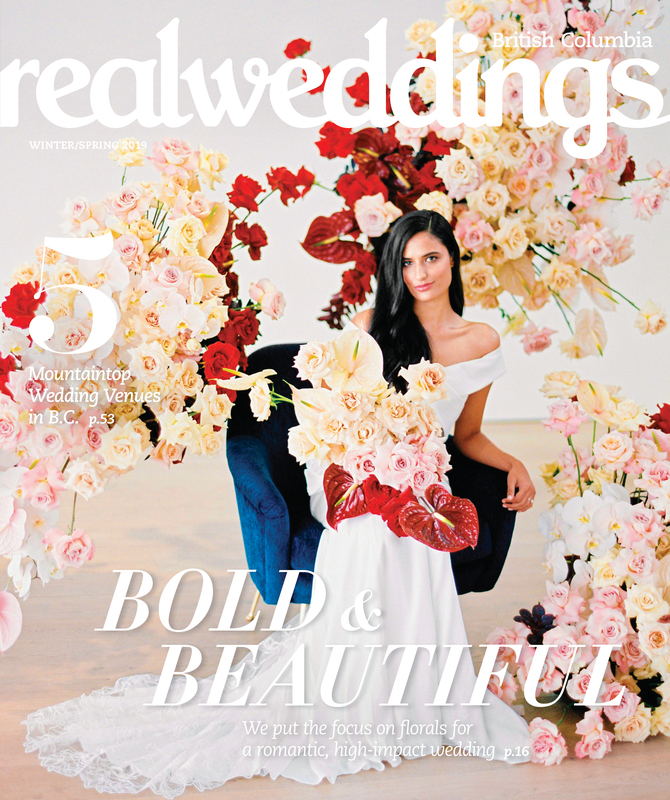 “The most sensational element was the big flower arch,” says Carly. 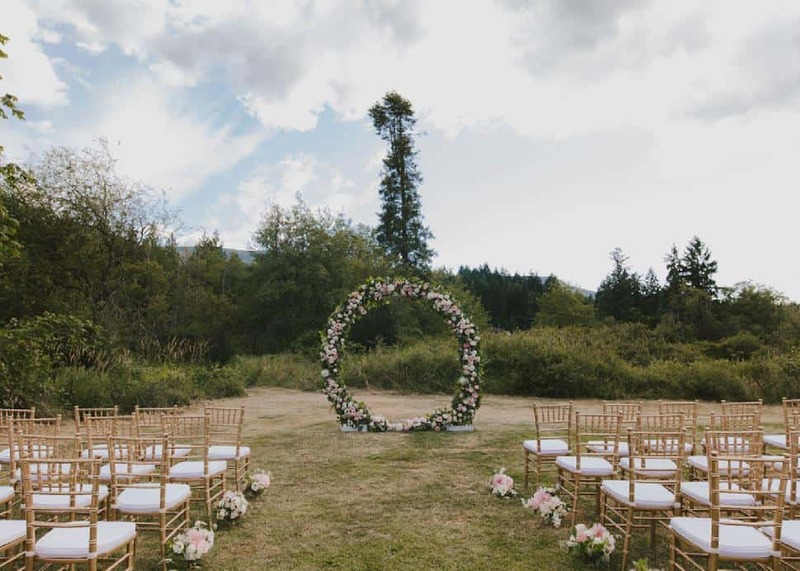 Fresh dahlias, sweet peas, foxgloves, six different types of roses and a host of other flowers from Night Song Farm were all assembled on the custom-made frame that day. 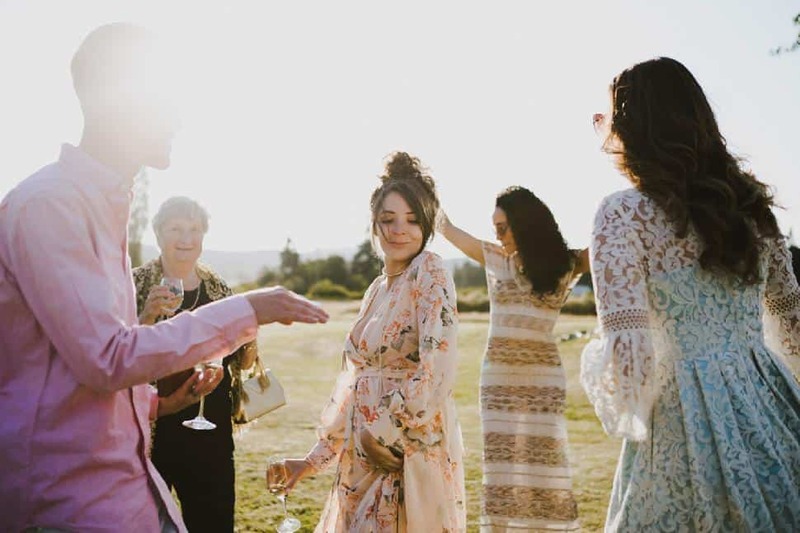 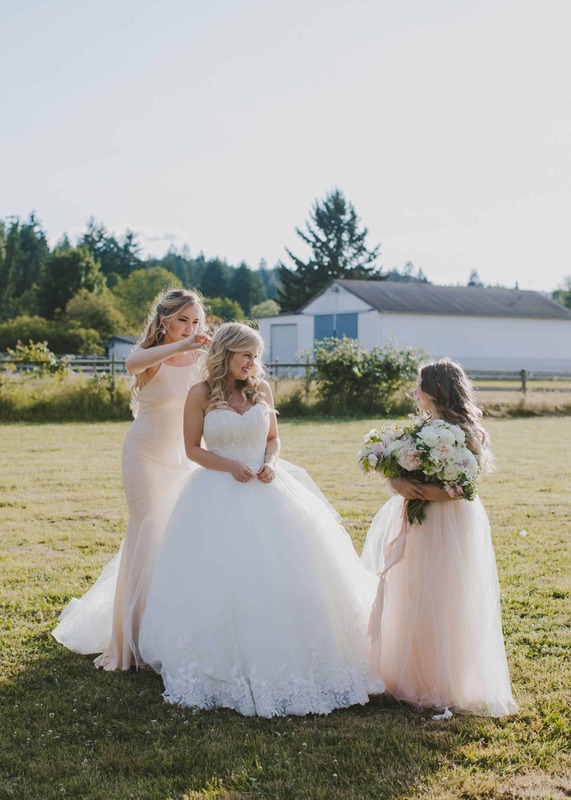 Morgan’s daughter Aryiah (second from left) had a custom-made party dress, while the other bridesmaids wore romantic blush sequin gowns from Bliss Bridal. 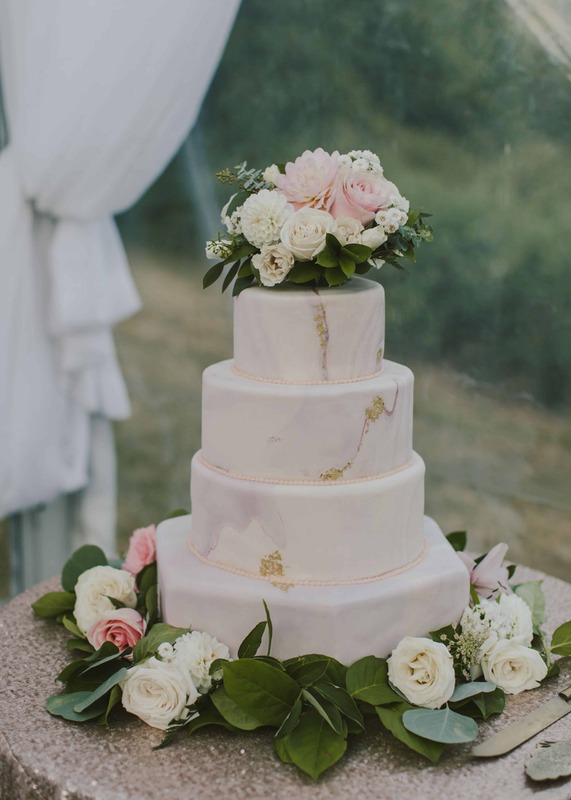 Cake Bread Artisan Bakery created a faux marble cake surrounded by white dahlias, spray roses, pearl yarrow and Italian ruscus. 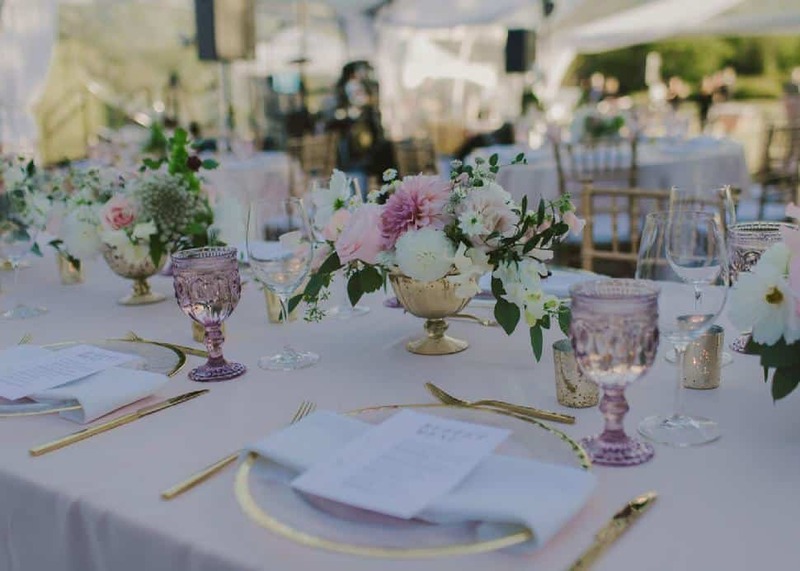 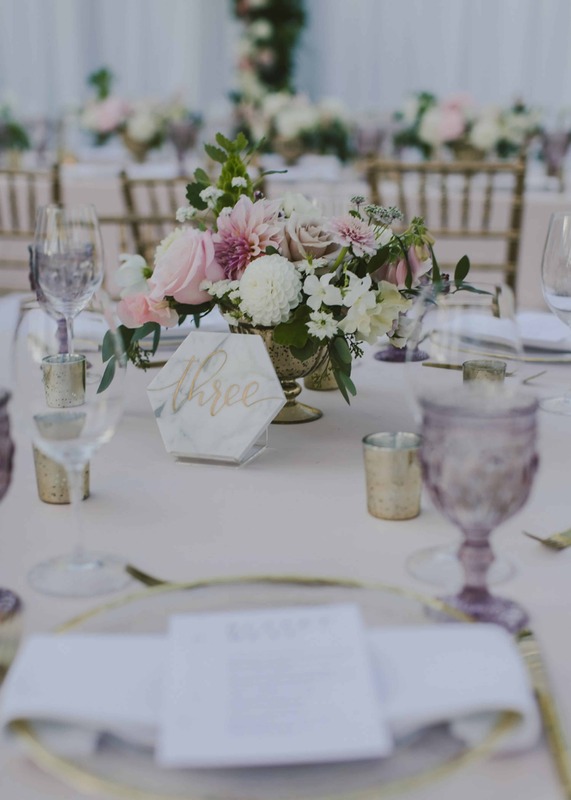 Tables were set with gold chargers, cutlery and pink crystal goblets around centrepieces of Café au Lait dahlias, pink roses and Chantilly snapdragons from Night Song Farm, along with eucalyptus and ferns. 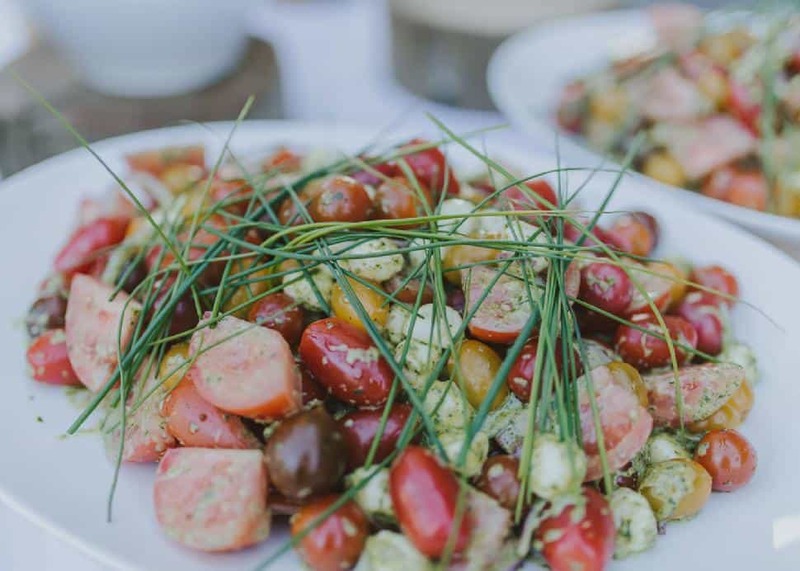 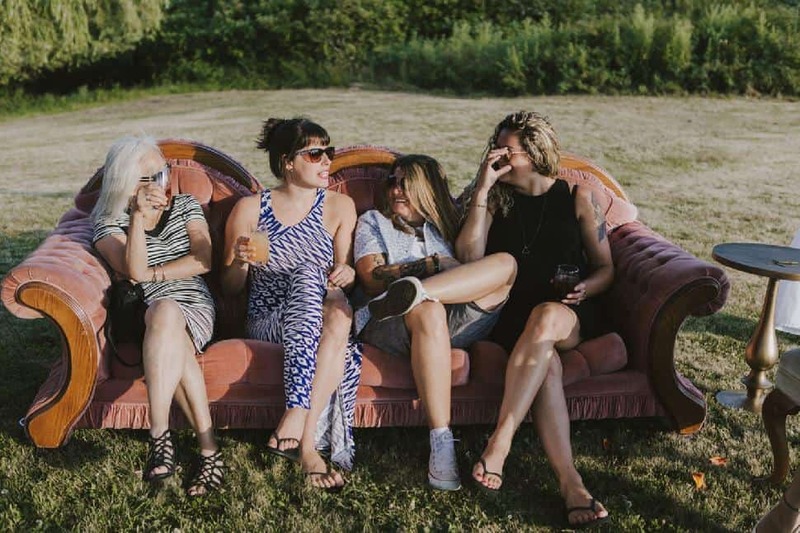 When it came to the food, Morgan wanted something that “felt like turkey dinner at Christmas,” with things like mashed potatoes and Brussels sprouts, while the bride wanted fresh farm salads and light organic chicken. 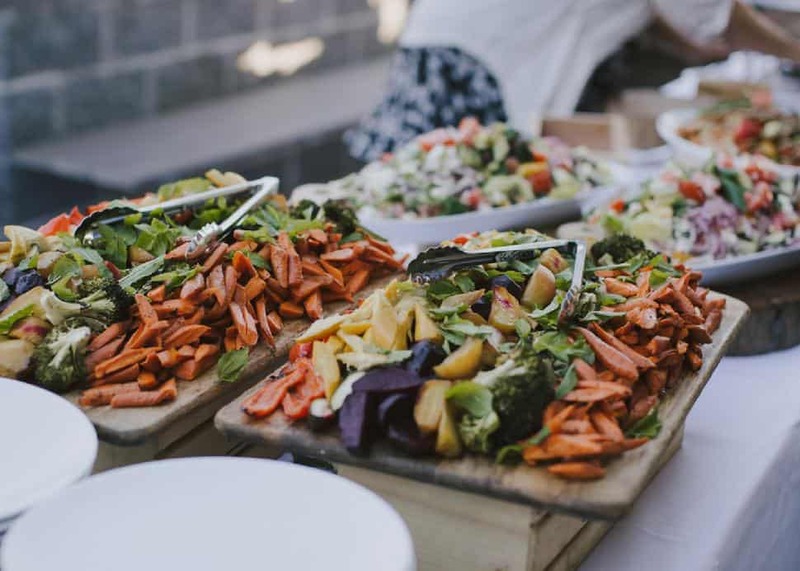 London Chef caterers of Victoria artfully married the two and the hot hearty foods turned out to be a complete hit as the evening cooled. 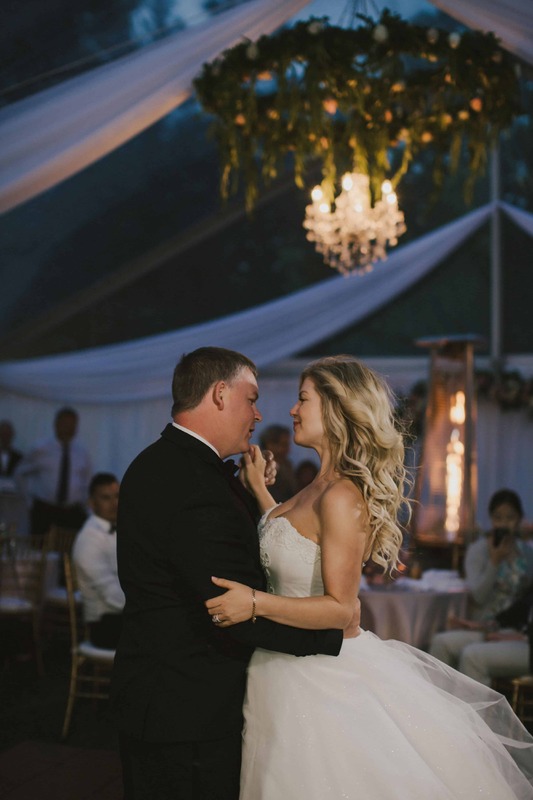 It was paramount to the couple that the guests were the star of the show. 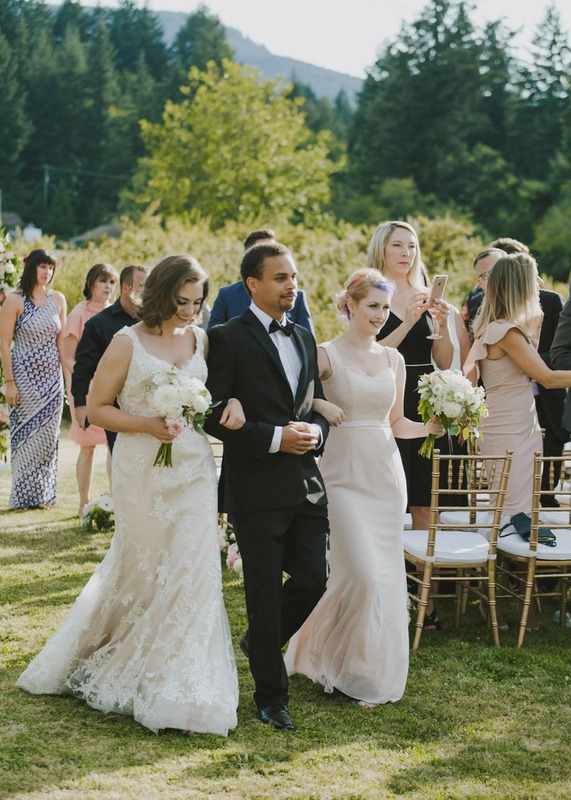 “I really didn’t want the type of wedding where everyone showed up and they weren’t taken into consideration,” says Carly. 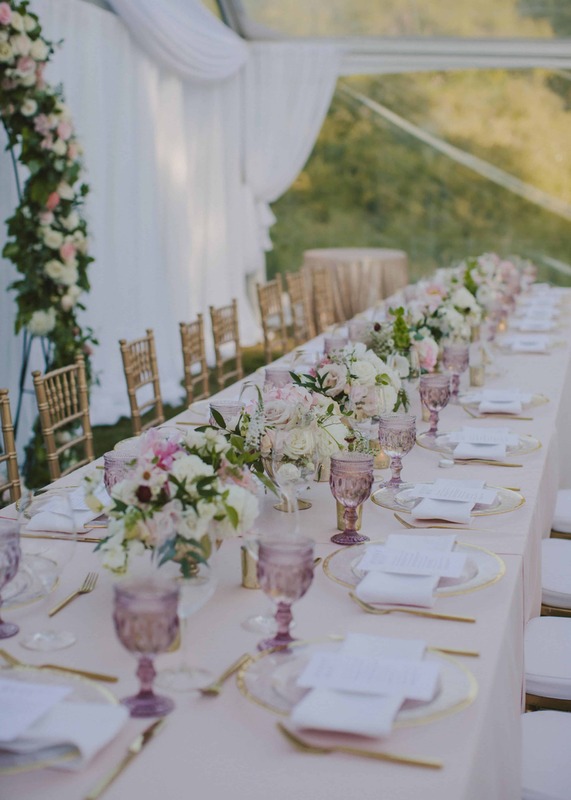 Guests arrived to glasses of champagne in blush pink stemware and a walk down a Hollywood-style red carpet.